Endurance swimmer and beloved Laguna local, Lynn Kubasek, died on Thursday, Jan. 24, at age 60, with friends by her side. On the evening of Jan. 22, more than 40 friends and fellow swimmers stopped by the small Woods Cove apartment of a neighbor who was caring for Kubasek. “We went in two by two,” said Tom Hale, a member of the swimming group Oak Streakers with whom Kubasek swam for years. Two sons, a daughter and four grandchildren—one 7 weeks old—survive her. 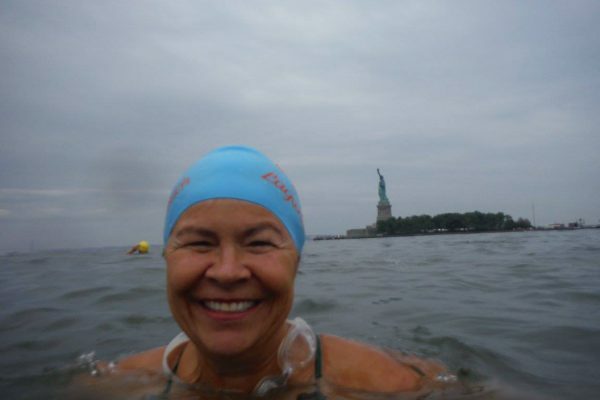 Kubasek was diagnosed with pancreatic cancer last September just after finishing the 20 Bridges swimming marathon,a 28.5-mile circumnavigation around the island of Manhattan via the East River, Harlem River and Hudson River, under its 20 bridges. Her diagnosis came just one week after completing a 50-mile Catalina Island relay. Kubasek’s achievements in open water swimming were numerous, among them, crossing from Santa Cruz Island to Anacapa in just over five hours in 2013. 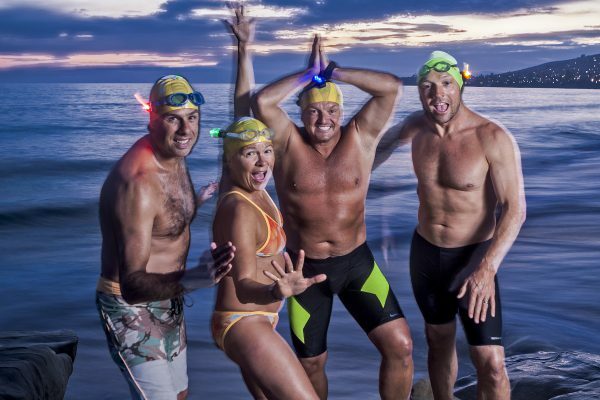 In 2015, garnering recognition for Laguna Beach, Hale and Kubasek were part of a relay team, 33.5 Miles Across the Sea, which also included Laguna locals Faith Hale, Roddy Teeple, Patsee Ober and Brett Rose, along with support kayakers Eric Zuziak, Rich Selin and Jamie Glazer,that made it into record books by crossing the Catalina Channel to Laguna Beach in just over 19 hours and 44 minutes. 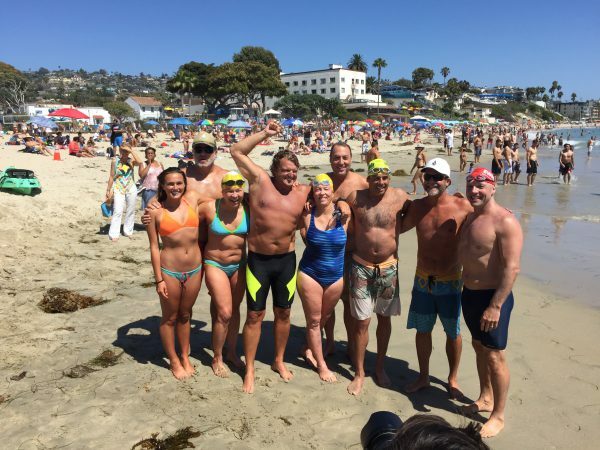 She completed 11 marathon swims (10 miles or more) over the last 10 years, and was also a board member of the Santa Barbara Channel Swimming Association. In 2011, Kubasek was a member of the first all-female team to successfully navigate the 27 treacherous miles of shark-infested waters between the Golden Gate Bridge and the Farallon Islands, starting and finishing in the dark after 16 hours and 29 minutes. Kubasek also competed in ice swimming contests. 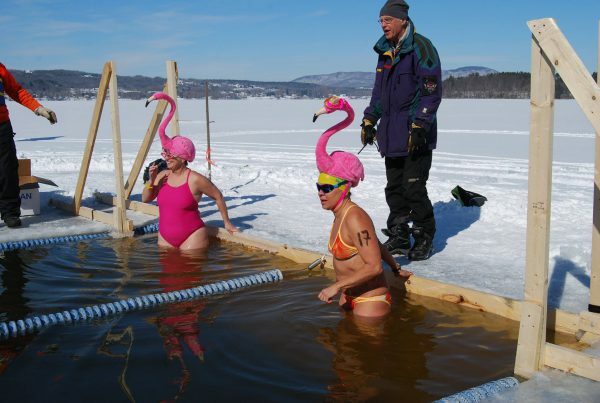 In 2016, she, Hale and Scott Zornig represented Orange County in the annual Memphremagog Winter Swim Festivalin Newport, Vermont, where a two-lane pool is cut into the 18-inch thick ice on Lake Memphre for swimmers who do not use wetsuits. The water temperature under the ice was 31.5 degrees. In the 25-meter breaststroke, Kubasek finished 14th with a time of 29.21 minutes, and in the Best in Hat competition, she was runner up along with Amanda Hunt of Naperville, Illinois, who coincidentally wore the same pink flamingo headgear. : Lynn Kubasek, right, improbably chose the same headgear as a competitor in a 2016 hat contest. Photo courtesy Tom Hale. In addition to being a passionate advocate for open water swimming, Kubasek was also an artist and environmentalist. She worked for the last 16 years as a water quality specialist for Fuscoe Engineering in Irvine. After once getting sick from swimming in contaminated water, she warned swimmers on aYoutube videoof the dangers of urban runoff and advised against swimming in the ocean immediately after a rain storm, saying she was more afraid of bacteria than sharks. Close friend, Cherie Edborg, said Kubasek’s apartment was filled with her art. She created paintings, drawings, watercolors and soap, even swimsuits of paper. A winner in Laguna’s Holiday Palette Competition, Kubasek’s depiction of a purple seal was displayed over Main Beach this past holiday season, as was her Banner Competition creation last summer. “A lot of people have probably seen her art and didn’t know it was hers,” Edborg said. Fellow board member at the Santa Barbara Channel Swimming Association, Zornig started a GoFundMe campaign for Kubasek, who had medical insurance, but created the page to raise funds for what he called “the hidden costs of having cancer treatment” and to make up for the time she’d had to take time off work for treatments. A paddle out and swim for Kubasek will be held in Shaw’s Cove at 9 a.m. on Sunday, Feb. 24. A Facebook page, Lynn Kubasek’s Celebration of Life, will feature a video about her, and information about a memorial service planned for Saturday, Feb. 23.